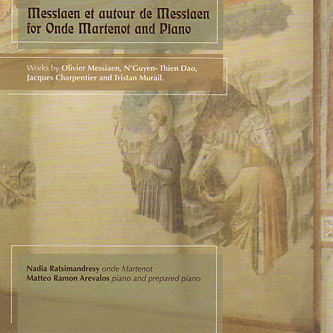 A very fine disc recorded by Nadia Ratismandresy and Matteo Ramon Arevalos, this collection of duets for ondes Martenot and piano features compositions by N'Guyen-Thien Dao, Jacques Charpentier, Tristan Murail, and of course Olivier Messiaen - the composer often cited as the Martenot's greatest composer. For those new to the instrument, a quick listen to any number of fifties sci-fi and horror soundtracks will reveal its theremin-like timbres, but for more adventurously modern applications of the Martenot, Radiohead guitarist Jonny Greenwood can be heard incorporating it into various songs from Kid A onwards. The first two selections recorded on this disc demonstrate the versatility and dynamic range of this most curious of instruments: the fifth movement from Messiaen's Quartet For The End Of Time begins the album in especially good form, working its weeping tonalities into the piece eloquently, before the far more visceral 'Bai Tap' by N'Guyen-Thien Dao offers a clanging demonstration of the abstract extremities within the Martenot's range of sonorities.